American Johnny Petrehn had to travel to Hungary to claim his second World Title in 2010. An event that battled tough weather and very soggy grounds proved difficult for teams from across the world. 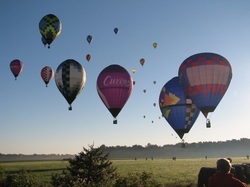 Battle Creek, MI USA hosted the 2010 US Nationals and offered some of the most picturesque morning flights. The pictures are truly stunning.